Monashee Provincial Park protects substantial stands of old growth cedar, spruce and hemlock. Lush green forests grace the valley bottoms and, in the spring, alpine meadows blossom with a colourful array of wildflowers. The park is also known for some of the oldest rock formations in western Canada. Peters and Margie Lakes sparkle beneath 2,697 metre high Mount Fosthall, the highest peak in the park and part of the rugged Monashee Range of snow-capped peaks that surround the park. Lucky visitors may get a glimpse of the rare mountain caribou or wolverine or the much more common mule deer, ground squirrels and pikas. This undeveloped mountain wilderness is a wonderful adventure for both experienced, backcountry hikers and willing beginners alike. Dogs are not permitted in this park due to potential conflict with red-listed Mountain Caribou. Fires are not permitted outside of the Spectrum Lake campground. Please be aware that active logging occurs along Spectrum Creek Forest Service Road (FSR). Park users driving to the Spectrum Lake trailhead can expect to encounter logging trucks along this access, as well as Sugar Lake FSR. Thanks to everyone who submitted comments, concerns and questions to our comment card box in 2014. Some common themes emerged – our responses are below. Campers must be prepared for extreme weather changes while camping and hiking in the sub-alpine areas of the park. Subzero temperatures are common. Monashee Provincial Park celebrated its 50th anniversary in 2012! Order your limited-edition Monashee poster for only $15.00 – with 100% of the proceeds going back to Monashee Park! 111 km north of Vernon. Take hwy #97 to Vernon, then go east on Hwy #6 from Vernon for 47 km, through Lumby to Cherryville. Turn north onto Sugar Lake Road and proceed 46 km until you reach the turnoff (km marker #22) to the park. Proceed on Spectrum Creek Road for 16 km to the park. An alternative access to the Park is from the Arrow Lakes side. Follow highway 23 south from Revelstoke to Shelter Bay Forest Service Road (FSR) and turn right. This active logging road is steep and narrow in sections. Follow the Sol Mountain Lodge signs. At kilometre 35 turn right onto North Fosthall Creek FSR, keeping right, for approximately 17 kilometres. The North Fosthall Creek trail starts at the end of the road. The trail may not be well defined and is not regularly maintained. This access should be attempted by experienced backcountry travelers only. The majority of this road access is maintained by Sol Mountain Lodge. Conservation: The Monashee’s peaks reach elevations of 3000 metres and the bases are cloaked in dense vegetation. Hiking the low elevations can be difficult, as the forest floor is comprised of clusters of devil’s club and nettles, but rewarding with groves of old-growth cedar, spruce and hemlock. Traversing upward, the distinctive alpine region unfolds with an array of wildflowers, heathers, mosses and lichens. The Protected Area protects flood plain to alpine. It also protects critical habitat of caribou and ensures continuance of their migration corridors. The area around Rainbow Falls and the riparian zone along a section of the upper Shuswap River are also protected. Wildlife: The cool summer temperatures and abundant vegetation provide ideal habitat a variety of wildlife. The park is home to one red-listed bird species, the Northern Goshawk, and two red-listed mammals, the wolverine and mountain caribou. As well as endangered species, the area also boasts moose, mule deer, mountain goat, marten, cougar, black bear, blue-listed grizzly bear and Townsend's big-eared bat. Mount Fosthall and Slate Mountain offer climbing/scrambling opportunities. Visitors can enjoy fishing for rainbow trout. Peters Lake has numerous fish though they are generally smaller than those found in Spectrum Lake. Anyone fishing or angling in British Columbia must have an appropriate licence. This undeveloped mountain wilderness is a wonderful adventure for experienced, backcountry hikers. There are also trails for the willing beginner. For your own safety and the preservation of the park, obey posted signs and keep to designated trails. Shortcutting trails destroys plant life and soil structure. There are two viewing platforms at Rainbow Falls. One is found extended out over Spectrum Creek just downstream from the falls to give visitors a beautiful, unobstructed view of the entire falls. The second platform is perched on the rocks nearer the falls bringing the visitor closer to the enormous power of the rushing water. Spray from the falls drifts over both platforms to feed the mossy forest below. The platforms may be slippery if wet. Lucky visitors may get a glimpse of the rare mountain caribou or wolverine or the much more common mule deer, ground squirrels and pikas. Campfires are permitted within fire rings at Spectrum Lake campground only. Bring a portable stove for cooking. To preserve vegetation and ground cover, please don’t gather firewood from the area around your campsite or elsewhere in the park. Dead wood is an important habitat element for many plants and animals and it adds organic matter to the soil. You can conserve firewood and air quality by keeping your campfire small. Limited burning hours or campfire bans may be implemented and some parks may use communal fire rings. Spectrum Lake group campsite is found approximately 100m from the main campground, on the northeast side of the lake. There is a large, covered picnic table shelter offering a place to keep dry, though it does not have a stove. There are six tent pads as well as a pit toilet. Use of these facilities is on a first-come, first-serve basis; reservations are not accepted. This area is also in a thick cedar forest with a meandering stream running through. This park has a day-use/picnic area at Rainbow Falls. There is a 15 car gravel parking lot with one pit toilet and an information shelter beside the trail to Spectrum Lake. The other trail leaving the parking lot is a steep, well defined trail that leads down to the falls. Wet areas are covered with boardwalk and footbridges. There are no picnic tables at the falls or in the parking lot. There are two wooden viewing platforms below the falls offering a spectacular view. There are three pit toilets at Spectrum Lake campground, one at the Spectrum Lake group site, and one pit toilet each at Little Peters, Big Peters and Margie Lake campgrounds, as well as one at the Spectrum Creek trailhead. Facilitated backcountry camping is available at four locations – Spectrum Lake, Little Peters Lake, Big Peters Lake and Margie Lake. The backcountry camping fee is in effect at these locations. Camping is also permitted in other areas of the Park without a backcountry permit. Campers must practice no-trace ethics. The park is open year-round, if accessible. Spectrum Lake, the largest campground in the Park, is located 6 km from the Spectrum Creek trailhead/parking lot. There are 16 sites spread out along the lakeshore and up-slope. Each site has a ten foot by ten foot wooden tent platform or framed earth pad, fire ring and picnic table. Some sites also have a small wooden shelter with cedar shake roof over the picnic table. There are a number of pit toilets. Spectrum Lake provides a great introduction to the backcountry experience for less experienced campers. The understory is sparse, with most of the ground carpeted by moss. A metal food cache pole is located at each end of the campground. 5km uphill from Spectrum Lake, or 11km from the Spectrum Creek trailhead/parking lot, Little Peters Lake is a much smaller facilitated campground. 2 framed-earth tent pads and a pit toilet are provided for those who choose the edge of the sub-alpine meadow as their overnight stop. 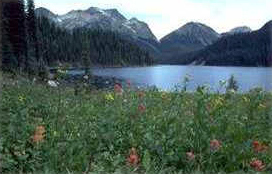 Big Peters Lake is the largest campground in the sub-alpine, located 13 km from the Spectrum Creek trailhead / parking lot, or 4km from Little Peters. There are 10 wooden tent platforms or framed-earth pads spread out amongst the trees on the southern end of the lake. There is a metal food cache box, a bear pole, and a pit toilet. The surrounding area is mostly open meadows and wetlands large pockets of Engelmann spruce and sub-alpine fir. Big Peters campground affords a staging area for those interested in exploring the alpine areas of the Park including Mt. Fosthall, Fawn Lake and Valley of the Moon. Margie Lake, a further 5km from Big Peters Lake, is the final facilitated campground in the sub-alpine area of the Park. It features 2 framed-earth tent pads, and pit toilet and a bear pole. Margie Lake is often used by those hiking over the Fosthall ridge from Sol Mountain Lodge, or up the North Fosthall Creek trail.